The South Texas Food Bank is on the front line of the hunger issue along the Texas-Mexican border that stretches over eight counties along the Rio Grande from Del Rio to Rio Grande City. And the life line of that front line are agencies and pantries that distribute food to the needy clients. And needy are plentiful, right in our own backyard. The poverty level in the South Texas Food Bank distribution area averages 30-plus per cent, which is double the state and triple the national average. Elia Solis is the agency coordinator for the South Texas Food Bank. She reports that 48 member agencies and 85 pantries are at the ready to serve the eight-county area. She notes that the average families served monthly is 22,722. Included are 36,508 adults, 19,000 children, producing 66,963 meals. More than 14,000 families per month are served in Laredo-Webb County. Solis adds, "The South Texas Food Bank is in need of additional pantries in each of the service area counties. The unemployment rate in these areas has not improved this year. The demand for food continues to increase and the existing pantries cannot meet the demand. "Many of the pantries have been affected by the negative economic conditions and are not able to increase their funding to reach more people. To better serve the needy families, additional distribution sites are needed." Zapata: Iglesia Pentecostes Emmanuel, 302 Highway 16; Concilio Buen Pastor, 402 Hawk Street; Helping Hands, Del Mar and 8th Street; Shepherds Pantry, 305 Hawk Street. 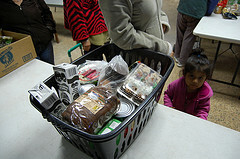 Jim Hogg: Hebbronville Food Pantry, 412 W. Galbraith. Dimmitt: Dimmitt County EMS, 1602 North First Street. Kinney: Kinney County Church Alliance, 111 W. Spring Street. Maverick: Boys and Girls Club of Eagle Pass, 1904 Antonio M. Garcia; Quad Counties, 253 Ruela, Pueblo Subdivision; San Lucas Lutheran Church, 1725 Edison; Kickapoo Traditional Tribe. Starr: Living Word Church, 709, North FM 2360; Templo Rosa de Saron, Elias Lopez Blvd. and 6th; San Isidro Pantry, PO Box 57; Self Help Center No.1, La Rosita, 4192 W. Highway 83; Self Help Center No. 2, Roma, 500 E. Highway 83; Self Help Center No. 3, La Casita, 6163 FM 1430. Val Verde: First Baptist Church, 301 Avenue G, Del Rio; Val Verde Commodities, 1690 Cienegas Road; Jesus Loves You Church, 310 Water Avenue; Bethel Center, 900 E. 13th Street.